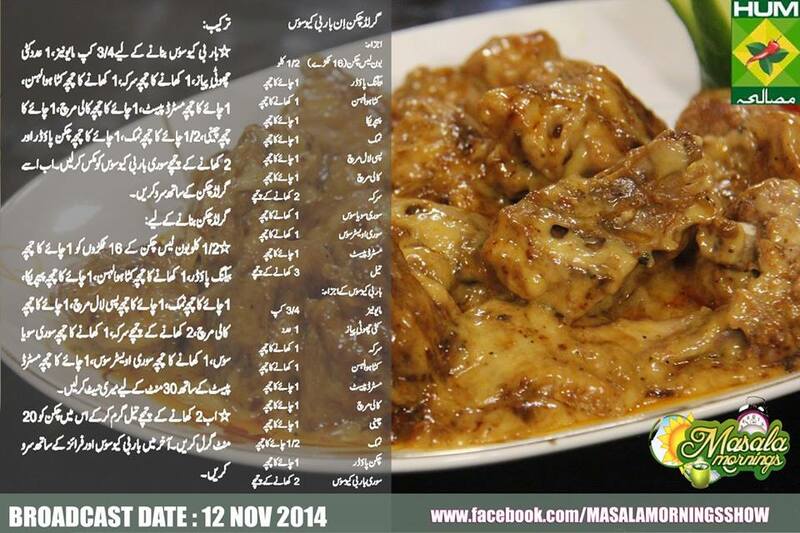 Pakistani Urdu Recipe Grilled Chicken in BBQ Sauce by Shireen Anwar Cooking Show Masala Morning at Masala TV. Grilled Chicken in BBQ Sauce is very delicious recipe. There is many Pakistani chefs like Gulzar, Zarnak Sidhwa, Shireen anwar, Chef Zakir who had prepared this wonderful recipe at Masala TV, but all of you know that Shireen Anwar Recipes has its own taste and charm. Every women likes to become like a cooking expert like this lady. Shireen Anwar also running a cooking academy in Karachi. Where is teaches her mouth watering Pakistani Cuisines. Marinate chicken with all the given ingredients for 30 minutes. Heat 2 tbsp oil, grill chicken for 20 mins, serve with bbq sauce and fries.